This collection brings together for the first time more than 360 of Mark Twain's short works written between 1851, the year of his first extant sketch, and 1871, when he renounced his ties with the Buffalo Express and the Galaxy, resolving to "write but little for periodicals hereafter." In October 1871 Clemens and his family moved to Hartford, where they would live until 1891. No longer a journalist, he was about to complete his second full-length book, Roughing It. The literary apprenticeship that he had begun twenty years before in the print shops of Hannibal, and pursued in the newspaper offices of Virginia City, San Francisco, and Buffalo, had at last come to a close. 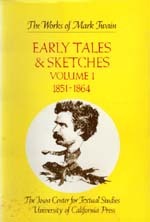 The selections included in these volumes represent a generous sampling from Mark Twain's most imaginative journalism, a few set speeches, a few poems, and hundreds of tales and sketches recovered from more than fifty newspapers and journals, as well as two dozen unpublished items of various description—the main body of what can now be found of his early literary and subliterary work, though by no means everything written during those twenty years of experimentation. The selections are ordered chronologically and therefore provide a nearly continuous record of the author's literary activity from his earliest juvenilia up through the mature work that he published in the Galaxy, the Buffalo Express, and many other journals.